James DeSantis and Garrett Magee have been hoeing it up all season on Bravo’s Backyard Envy. 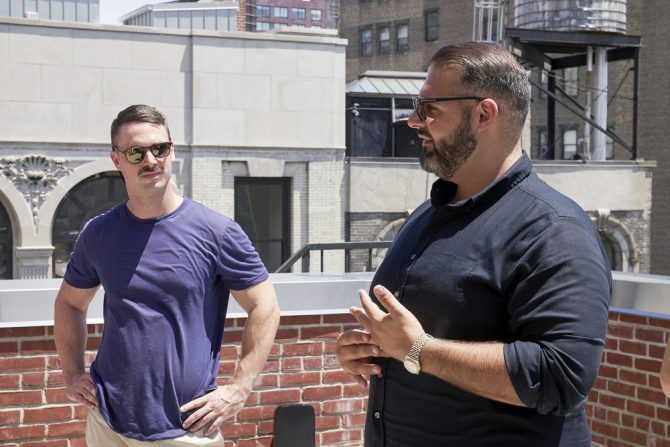 Each week, the besties and business partners put their green thumbs and impeccable eyes for design to work on rooftop oases and secluded gardens all over NYC and its surrounding suburbs, making their rarefied world just a little bit lovelier. The pair have known each other for years and started their landscaping design company Manscapers with pal Melissa Brasier back in 2014 after their picture-perfect garden parties start gaining buzz. With celebrity clients like Meryle Streep, Dian von Furstenberg, and Ladyfag, it wasn’t long before Bravo came calling. Ahead of Backyard Envy’s first season finale this week, Queerty checked in with DeSantis and Magee to see how reality TV stardom has changed their lives. The pair got real about taking their business to the next level, giving back to the community and dealing with the downsides of all this attention. It doesn’t sound like either of you set out to have a career in landscaping. How did you get interested in the field and how did you know that switching careers was the right thing to do? Magee: I grew up with a family that did landscaping, so it’s always been something that I was interested in. But I went to college for graphic design and video editing. After moving to New York and doing that work for a few years, I just got to the point where I was like, I cannot work inside of an office anymore! I was tired of working in a dark cave editing. I just wanted to be outside again. DeSantis: Mel and I were both in interior design. We’d kind of seen that there was this hole in the market with landscape design, especially in New York. It was not highly competitive. There was nothing young and urban-based. Everything was traditional, granny, Connecticut-feeling. So, when we started Manscapers, we wanted it to be really marketed toward LGBT, middle- to upper-class clientele—people that we knew who work in fashion and design. When you’re hiring us, you’re getting that design lens, and our clients really notice that. But did you have a moment like Garrett had, where you knew that making the switch from interior design to landscaping was for you? DeSantis: Yeah, I wanted to make more money. Doing interior design in New York City is extremely competitive and there’s a level that you reach and you kind of stay there. But I saw that if we started something that was really new and different, that had the potential to have a really broad clientele in New York, we could start to make a lot more money. Owning your own business is always a risk, but I think that risk is worth taking for a really big reward. I believe Melissa mentioned something on social media about watering plants at Meryl Streep’s house. Who are your other celeb clients? Any fun anecdotes—or anonymous dirt? DeSantis: I don’t really wanna name any of our celebrity clients, actually, because they really don’t like it. But when we work with celebrities we always have to deal with their handlers or their house managers. There’s always more than one client. You have to report to three or four different people and make sure that the work is really impeccable. So, while it’s great to have celebrity clients and they can refer you to other people, sometimes it’s challenging. Magee: Also, we get some very interesting requests from some of our more high-profile clients. One of our clients, he owns a piece of artwork at a cabin and he wants to crane it up to his rooftop. So, we’re trying to facilitate how to do that. And one of our clients—very, very gay—he wanted to create a full runway down his rooftop, making it look like it’s almost an airport runway. So, how do you go from small business owners to reality TV stars? What was that process like? DeSantis: We were approached to do the show. It wasn’t something that we were reaching out to do. I think as the process went along, we got more into it. But it wasn’t something where we were like, Oh, we desperately want to be on television! It was really a way for us to expose our business to a broader audience so that we would become a household name. We’re working on developing different product lines right now. We’re working on a few different book ideas. Our appearances on different shows like Rachel Ray—all of that stuff probably wouldn’t have happened as quickly if we didn’t have major exposure on television. Living in this day and age, you have to set your brand apart and you have to do it very quickly. That’s why we did it and that’s the trajectory we’re hoping to continue. Manscapers is a legit, real business that you’re still running. How do you make this second career of the show work while still running the business? Magee: We are still figuring it out. In no way has this ever been a project that we have totally just managed. It’s an ongoing thing, trying to figure out how to manage our business and do the television show, and it’s a learning process. I’ve come to realize we will continue to keep learning along the way. By now people are familiar with shows like this—Flipping Out, Pregnant in Heels, Blow Out. Was there anything about those shows that made you hesitant to do Backyard Envy? Was there anything you wanted to make sure you did differently? DeSantis: Yeah, very good question. The new direction, the type of show we’re on, is very different from Flipping Out, which is called a “follow occu-series.” Our show is a design renovation show, which is something new that Bravo’s trying. They’re trying to get away from being known only for Housewives and dramatic business occu-soaps. Our show is one of the first of its kind within the Bravo Home category, which features more family-friendly approachable content. That was a major part of our decision to do it because we wanted to keep our audience really broad. At the end of the day, there’s drama in our show, there are little fights, little hiccups through the clients, through our relationships. But while we were filming, no matter what, World of Wonder, the production company, was very specific: every drama needs a resolution. There needs to be a positive outcome in the end. Magee: Yeah, in no way did we want to be on a show that was going to be pitting us against each other and full of drama. We wanted to make sure this was representative of our business and really showcasing our friendship and our work. Were there particular challenges to getting clients and potential clients to appear on the show? So, the show has been on for a couple of months. How have your lives changed? Magee: People keep asking me that and I really don’t think my day-to-day life has changed that much. The main thing that’s changed for me is our email inbox. We’re currently getting flooded with emails from people asking us to come do their yards around the country, and right now we still only work in the New York City area. But when people are like, “Are you riding the train?” I’m like, “Yes, I’m riding the train!” It’s not as if people are running up to me or anything. I will say this: I do feel a little bit different in the sense that we have a voice and a seat at the table now. I think it’s really important that we remember that. We do have a new platform. We’re trying to develop different way to use that in a positive way. Magee: We trying to figure out a way to give back. One of the charity programs we’re thinking about working with is Green Thumb, which is run by the parks department of New York City. DeSantis: And we’re doing a big event with Housing Works, and we’re getting involved with the New York Botanical Garden. So, we’re trying to give our skillset to historical preservation. James, you’ve talked elsewhere about wanting to address male body image issues. What do you hope to convey about that on the show? Magee: It’s something I’m still getting comfortable with, but I’ve actually been talking to a few—it’s actually called “brawn” modeling. It’s this new movement of bigger men that are part of this category of modeling. Not that I’m thinking of taking up modeling, but I’ve connected with a few of them and I think I’m going to do this podcast about it. It’s something I’ve been struggling with. I’ve had a few fat-shaming incidents happen already on Twitter. People have sent me links to Spanx and bodysuits. It’s hard. You have to have tough skin, especially being on TV for the first time. I’m kinda working through that. Right now, we’re really putting the business first, but I’ve written a few things. I have a blog post for Bravo that’s going to come out soon. You and Garrett are longtime friends and I’m curious what kind of conversations the two of you have had? DeSantis: Yeah, we have, but I don’t know how much I want to get into that. Magee: Until we got this national platform, it really hasn’t ever been an issue between us. I’ve never noticed it be an issue between our groups of friends because at the end of the day James is obviously a very handsome guy and it’s never been a problem until you’re in this national spotlight. It’s something that I think both of us are learning to deal with. DeSantis: But it’s two different journeys. Well, Garrett, I wonder if you’re experiencing something parallel: being sexualized and objectified. Magee: It’s more just like, sometimes a little too vulgar and gross. But, I feel like my situation is different. I guess all we can do is block people. [Laughs] Instagram was around before out TV show. That’s what people do on Instagram. Shoveling my way through the week. #tbt to summer #backyardenvy ???????? What have you noticed about the way gays are responding to the show? DeSantis: It is particular. As Garrett said, we get vulgar comments and things like that on Instagram. I don’t know. I don’t really know how to answer the question actually. Magee: I have to say, for the most part, other than things related to our bodies, as far as the community goes I think it’s been extremely positive. Not that we’re supposed to be looking for comments on Twitter or anything. But for the most part, people have been very supportive of the show. People have said that it’s so nice to see gays on TV that are not representing just being gay. We’ve had people that are closeted in Tennessee message us and say that it’s so inspiring to see gays on TV doing heteronormative jobs. It’s just two gay guys on TV doing landscaping and it’s not something like Queer Eye that focuses on the gay aspect. Do you watch the show? What’s that like? DeSantis: I watched the first four episodes and then I stopped watching the show. The feelings that it was bringing up were not worth seeing the finished result at this point. But I think I will watch it at some point. I need to be in, like, a little bit better head-space to watch the whole thing. But it’ll happen. Magee: We’ve watched most of the episodes together. We have a viewing party almost every week, but we’re watching it in a group setting so I guess you’re not watching it super closely. DeSantis: Exactly. I haven’t watched it on my own. Sitting alone and watching yourself is really weird. Magee: But we lived it. It’s fun to watch it back, but there are moments where I’m like, Oh, God! Why did they have to put that in! Magee: I’m pretty sure James knows what I’m going to say. It’s my drag name: Liatris Gayfeather! Liatris is the flower, the common name is gayfeather. DeSantis: It’s a beautiful purple flower. Mine are plants that don’t really live in New York. More tropicals. I love palm trees and agaves. Anything that can survive in warm weather. No t, no shade, but do people REALLY hit on the bigger guy? I would. It’s like some people forget that bears are a thing on a regular basis. My Dear, All different types of guys get hit on. Not just the young and pretty. I know, that must be quite a NewsFlash for you, so sorry….. But then again, there are people that will f* anyone that’s been on tv.